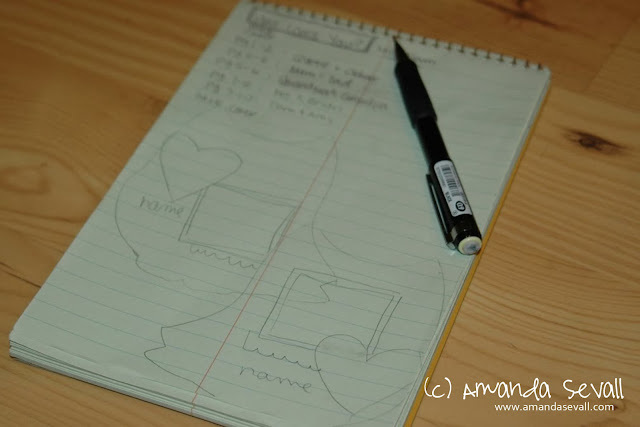 Amanda Sevall Designs: Flashback Friday // Kid Friendly Mini Album Tips & Tricks Edition. Flashback Friday // Kid Friendly Mini Album Tips & Tricks Edition. Originally written: October 15, 2010. For a few months now, I have been thinking about making my nephew a little book of family photos. He loves pointing out everyone in pictures and reading, so this will be perfect for him! Most important to me is making it durable, fun and kid friendly. 2. 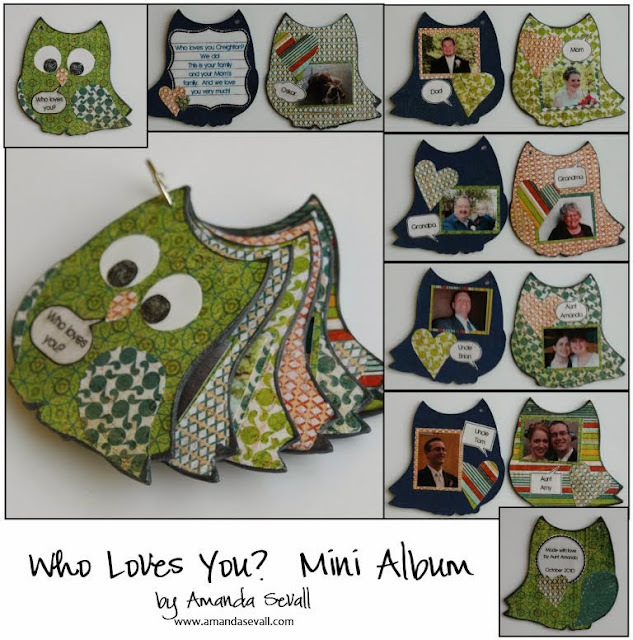 Pick major products – mini album type and patterned papers. 3. Create a page + picture list. I was inspired to finally put this album together when I first saw this Maya Road Owl Coaster set. Perfect! 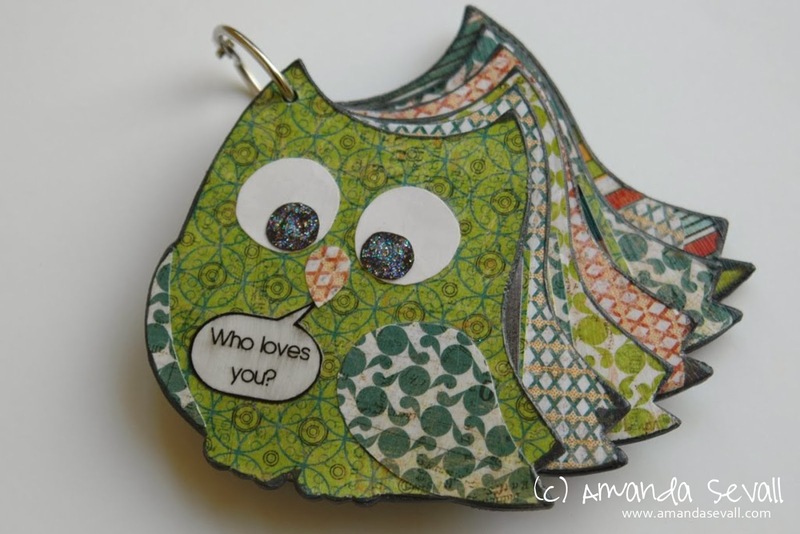 And it inspired my title: “Who loves you?” I love the play on words! But what paper to use? I wanted to make sure I got something bright and colorful. Kid friendly? My thought it to go with something distressed so that it will help hide the dings and love this kid is going to give it! Obvious choice is to use some Basic Grey and I’m in love with the new Wander collection, so easy choice! Usually at this point, I would gather all potential embellishments. In this case, I’m going to make this book the opposite of my normal work - minimal embellishment. I don’t want those cute little hands ripping off and chewing on anything small that might be a choking hazard! BuildingOnce I get to this stage, I want to get done as quickly as possible. First, I grabbed all my owls, some coordinating colors of Maya Mist and sprayed five of the owls on the back side to begin building my mini album. I kept the colors light so I could add a second layer of texture with stamps. I’m trying to add some depth without thick embellishments. 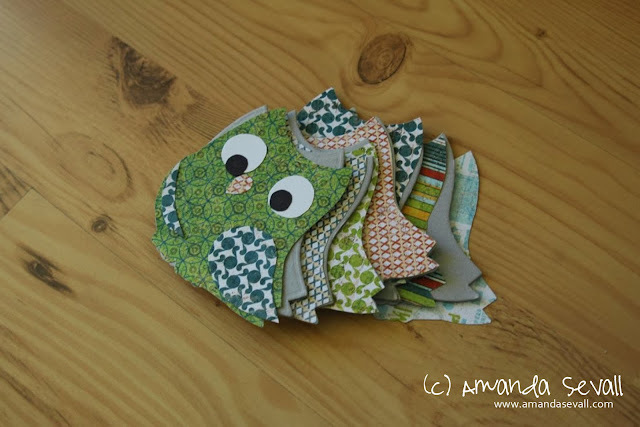 Then, I cut out seven owls – one for the front cover, one for the back cover, and one each for the front side of the pages. 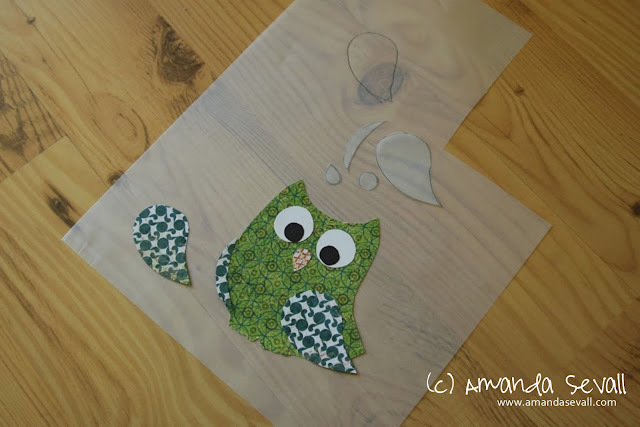 I did this by just holding one of the chipboard owls up to my paper and using it as my cutting guide. Now for the final steps, building the covers and sealing the album. The covers were the most fun! I used the embossed image that came on the chipboard as a paper piecing template by tracing it onto tracing paper and cutting it out by hand. I then sketched out what I thought the owl would look like from behind and cut that out too. 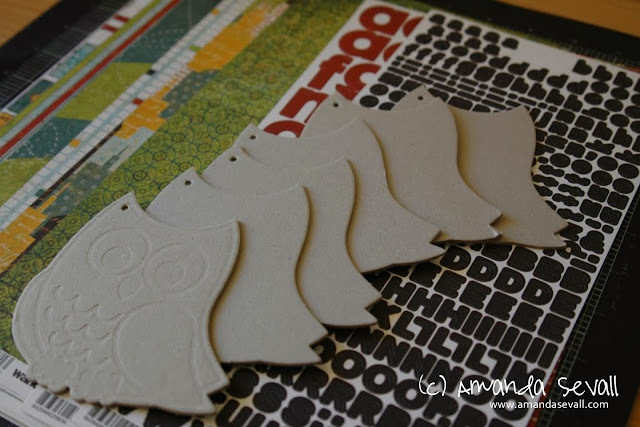 I used my tracing paper templates to cut out the patterned paper. I glued it all down with permanent adhesive. Now it’s all shiny and kid proof! A simple ring to hold it all together and it’s ready to go!! Once all the misting, stamping, gluing and distressing was done, I added one last layer of distressing by inking the edges with distress ink. Then, I added my papers, photos, names and small embellishment to finish the pages. To make these as kid friendly as possible, I printed the photos out on smooth cardstock to make the final step of the mini album easier. Next the critical kid proofing step… modge podge! I grabbed a big bottle of it, some foam brushes and then got to work. I covered one side first, let it dry and then repeated on the other side. Subject: Something that suits their interest and is recognizable to them. Chipboard: Much more durable than paper! Board books at the store are the same as the chipboard we all buy! Have Fun: Pick something fun shaped to capture their attention. Squares are fun, but an owl? Way more interesting! Colors: Bright primary colors are the obvious choice. 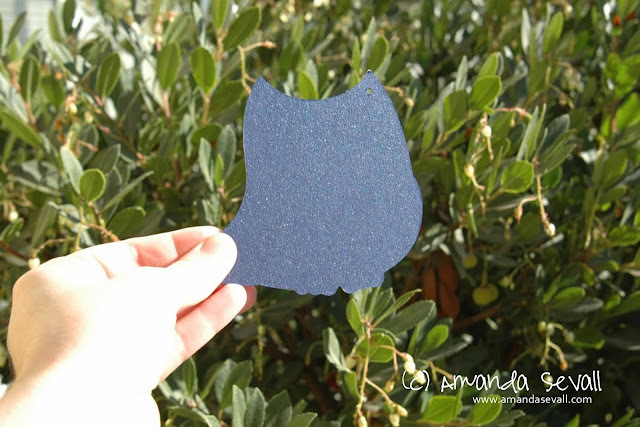 Any fun, colorful patterned paper would be perfect! Distress: To help hide the kid wear + tear. They’ll help you distress it more when they get those little hands on it! Less is more: Kids want the pictures and colors… the fun shape. They don’t care about all those extra doodads we love to add! Modge Podge: Seal that baby up! Make it smooth and shiny. It will help it withstand those cute dirty little hands playing with it! Make sure everything you are using will take the modge podge – I printed my photos on cardstock to help with this. Anything that won’t work with modge podge, make sure you add it after the modge podge! So I hope this inspired you to make your own book for the little kiddos in your life or to help you plan out your next mini album. I made another mini album using the same owl coaster album so I'll have to share that again soon. I love it as much now (if not more) than before! So glad to hear it's held up so well.